It’s an unfortunate reality of the world we live in that we all have to be hyper vigilant when using our personal and banking information. The experts at Diamond Credit Union are here to help you avoid sticky situations involving fraud, identity theft, and scams of all kinds. The Fraud Report is where we post the latest tips and information to keep you and your information safe. Expert advice available. In addition, if you experience any type of identity fraud or exposed account information, Diamond offers a free service to all members to assist in these type of cases. Contact Diamond to utilize these valuable services. We are ready to assist should you have any questions on this or related matters. Swift resolution is important. Learn more about CyberScout. Equifax has revealed a security breach, that began in May and continued until it was discovered in late July, exposing the names, social security numbers, birth dates and home addresses for up to 143 million Americans. According to news reports, the hackers exploited a “website application vulnerability” and obtained the personal data about American as well as British and Canadian consumers. Equifax is offering free identity theft protection and credit file monitoring services for those who are affected. Information can be found at: www.equifaxsecurity2017.com (click on the “Enroll” tab) or Equifax has a phone line for consumers to call if they have questions relating to the hacking incident at 866-447-7559. Email/Text Alerts. Setting alerts on your account is one of the most effective and quickest ways to identify suspicious activity (ex: account balance under $100 or transactions over $100). Speak with a Diamond representative to assist in setting up these alerts. Check your credit reports. Identify what information it contained and look for any unusual activity that could indicate identity theft. This is available free for all three credit bureaus at www.annualcreditreport.com or toll-free at 1-877-322-8228. Change all user access credentials. If you use the same passwords for all financial institutions, change them. Consider using a different password for each site. Watch out for suspicious email, phone and snail-mail scams. Enable text and email alerts and turn on two-factor authentication when possible. To help ensure the security of your account(s) at Diamond, an expanded fraud detection and prevention service has been added on Diamond Visa Debit Cards at no cost to members. If you have provided Diamond with a cell number, this monitoring service will now alert you of possible unusual activity on your account(s) by text message. These messages originate from Diamond and may show as sender number 328-74. You will be prompted to respond using your cell. If no reply is received, the monitoring service will attempt to contact you by your phone numbers on file. These texts will only ask members to verify if they did or did not make the purchase(s) in question. They will not ask for account or personal information. If you have any doubt on the validity of the text, or have general questions about this monitoring service, please contact Diamond’s Call Center at 800-593-1000. Verizon®, AT&T™, Sprint™ and T-Mobile® users within the U.S. will not be charged standard data or message rates for these alerts. We have received reports that some Diamond members have been contacted via Facebook Messenger and asked if they would like to use their Diamond Credit Union account to make money. This is a scam. Please do not respond to these messages. Go to the page of the person sending them, report the page to Facebook, and block the user. We will continue to monitor this situation. Please be aware there is currently a phishing scam being transmitted through emails asking the recipients to update their personal information via the online verification form. THESE EMAILS DO NOT ORIGINATE FROM DIAMOND. Please do not click on any link within the email nor provide your personal information. Delete the email and contact the Service Call Center if you inadvertently clicked the links in the email. Diamond will never ask to verify personal information through email. The email address of the sender is not Diamond. The verbiage in the email is not typical of Diamond (such as Diamond uses the terms members not customers, and credit union not bank). On September 22, Yahoo! announced that potentially 500 million user accounts have been compromised starting in late 2014. The data stolen contained enough information that, at a minimum, significant social engineering could be occurring (or perhaps is already occurring). Please be EXTREMLY cautious if receiving any emails or other correspondence from Yahoo! or Yahoo! email accounts, as they could possibly be malicious. Although Yahoo! reports that the breach did not include bank account information, Diamond encourages you to monitor your account and review your credit report. Members can contact Diamond for a personal Loan Health Check-up. Diamond account holders can take advantage of the identity management services available through our partner CyberScout. By following the 7 Tips for Yahoo! Breach Victims, provided by CyberScout, you can reduce your vulnerability. Find more info on the Yahoo! breach and other preventative information at CyberScout. 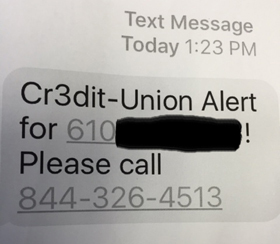 There is a text message scam currently going around that is asking people to call 844-326-4513 because their debit card has been blocked. Once they call, they are put through an automated system that asks for sensitive information. This is the current scam, but similar scams exist with different phone numbers. If you get a text like this do not call the number back and do not give any personal information. If you are concerned that your card may be blocked, please call Diamond directly at: 800.593.1000 or 610.326.5490 to check on your account status. This scheme is referred to as a Phishing Scam. Criminals are sending this message out to mass groups of people in hopes that someone provides their personal information, which can then be used to steal their identity. Don’t fall for it. Always call Diamond directly if a situation seems “Phishy”. Please be aware there is currently a phishing scam being transmitted through emails asking the recipients to update their personal information via the online verification form. THESE EMAILS DO NOT ORIGINATE FROM DIAMOND. 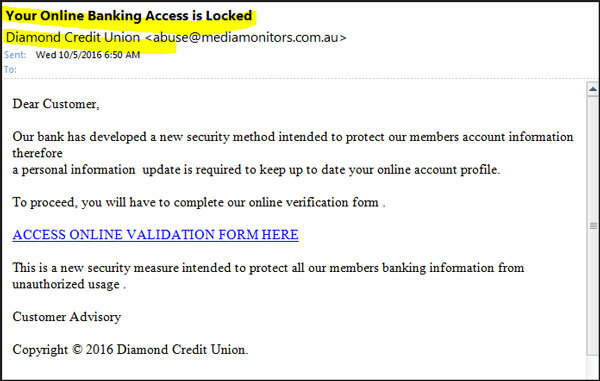 Please do not click on any link within the email nor provide your personal information. Delete the email and contact the Service Call Center if you inadvertently clicked the links in the email. 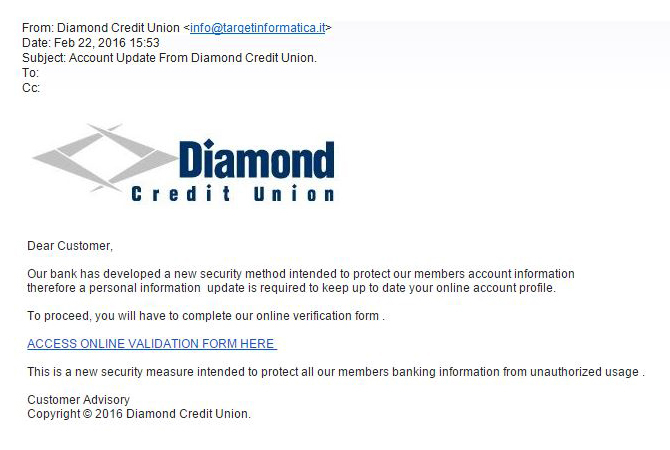 The verbiage in the email is not typical of Diamond (such as members not customers, credit union not bank). Monitor the activity on your account(s) through Diamond’s NetBranch Online Banking.